During 2018, over 150 activities will vindicate culture as a key factor in the differentiation and singularity of the country as a tourist destination. Catalonia will focus this year on the worldwide promotion of its cultural legacy as a tourist attraction. In the framework of the European Year of Cultural Tourism, the Catalan Tourism Agency (ACT) will carry out more than 150 events with a budget of 2.8 million euros. It is a ‘bidirectional’ challenge in which culture enhances the uniqueness of the tourist attractions of the country, while tourism assumes the challenge of asserting culture and contributing to its social and economic sustainability. This program is a part of the commemoration of the European Year of Cultural Heritage, promoted by the Council of Europe and the European Parliament. Nobody doubts about the vast cultural richness brought by universal artist such as Gaudí, Picasso (who lived in Barcelona in his youth) or Dalí, who was essential to put Catalonia’s capital city or Figueres in the map of cultural attraction. However, there are many rather unknown cities that have an incredible cultural interest. With this purpose, several promotion campaigns, fairs, cultural routes, itineraries and exhibitions are taking place this year and will be carried out by professionals in the tourism and cultural sector as well as for the general public. It will be the first time that both sectors will share efforts, in an unprecedented collaboration. 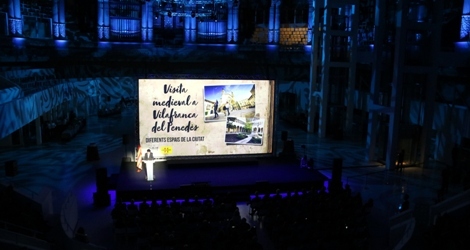 The impressive oval hall of Museu Nacional d’Art de Cataluya (MNAC), in Montjuïc, has recently hosted the presentation of the campaign, which was attended by 600 people, among them, many local authorities, tourist promoters and cultural managers. Which countries is this campaign addressed to? According to its promoters, the markets with a higher priority for this initiative are France, Germany, Italy, the United Kingdom (UK), Russia, Ireland, Belgium, Norway, Sweden and Spain, although they are also very interested in attracting visitors from other countries such as the United States, Australia, China, Japan and Chile; countries that, despite being farther, provide tourists with a high cultural interest. ACT also wants to change, for the better, the opinion of visitors that stay or have already been in Catalonia and are not actually very excited about the cultural offer. Some of the challenges comprise boosting a better territorial distribution of tourist activity, which means taking advantage of, among other factors, to work on ‘seasonalization’ by emphasizing the tourist value of Catalan culture and increasing the consumption of cultural tourism experiences of visitors once they are in Catalonia. In other words, try to convince the visitor that culture interest covers other seasons of the year beyond spring and summer and it is expanding beyond Barcelona and the Costa Brava, for example. Cultural tourism takes on a number of other themed years such as those dedicated to ‘Family tourism’, back in 2014, Mountain tourism (2015), Gastronomic and Wine tourism (2016) and Sustainable and environmentally-friendly tourism (2017). Catalonia currently holds eleven recognitions from the United Nations Organization for Education, Science and Culture (Unesco) on its cultural, historical, artistic and landscape heritage. Three of them are known as ‘Intangible Cultural Heritage of Humanity’. The list includes: La Patum de Berga, recognized in 2005; the ‘Castellers’ (Human Castles), in 2010 and the ‘Torches of the Pyrenees’ (2015). With regard to the Cultural World Heritage, Catalonia has the work of Antoni Gaudí (1984-2005); the Monastery of Poblet (1991), the Palau de la Música and the modernist group of Hospital de Sant Pau and la Santa Creu of Domènech i Montaner (1999); the Romanesque church of the Vall de Boí (2000); the Roman archaeological site of Tarraco (2000) and the cave paintings of the Mediterranean arch, located in Ulldecona, Montblanc and Cogul, among others (2015). In addition, Catalonia has two Biosphere Reserves designated by Unesco located in Terres de l’Ebre and in the Massís del Montseny.